I first learned about this Cantonese home-style dish from my boss at my part-time job during university. Actually, I did not so much "learn" about it, I merely "heard" of it. 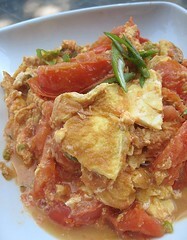 My boss mentioned that his mother did not cook much at home, except for cooking stir-fried egg and tomato. I guess I saw no reason to cook this dish at home. The thought simply didn't occur to me. I haven't even actually seen this dish in person before. But, browsing the recent Gourmet edition, I saw a recipe for it. Since we were already breaking out the eggs for Yaya's Golden Egg Torta, I thought, why not? As promised, this was a very easy dish to do. Of course, this assumes you weren't in the middle of cooking when you realized that you forgot where you placed the camera, resulting in some slightly cooked-more-than-they-should-be eggs. But, let's not get ahead of ourselves. In a wok, I heated some oil then poured in my beaten eggs. As soon as a film on the bottom forms, one is supposed to pull the eggs out. This is the part where I had to scramble around for the camera, so my eggs had a thick skin on the bottom by the time I took a picture. So, the eggs go out. 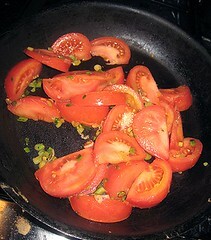 In the same wok, I stir-fried some green onions, then the tomatoes, seasoning with salt and a little sugar. The eggs go back in, the mixture cooks for a little bit, and the dish is done. 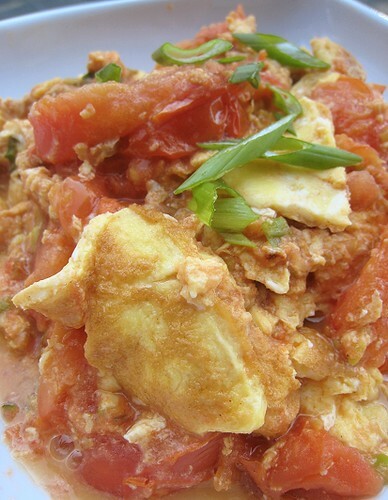 Despite my errors -- the "over-cooked" eggs, the perhaps-overcooked tomatoes -- this dish was filling and comforting. Besides, one can't be too much of a perfectionist when making a home-style dish, right? We decided to have egg-on-egg action and had both this and Yaya's torta with rice. Nice. 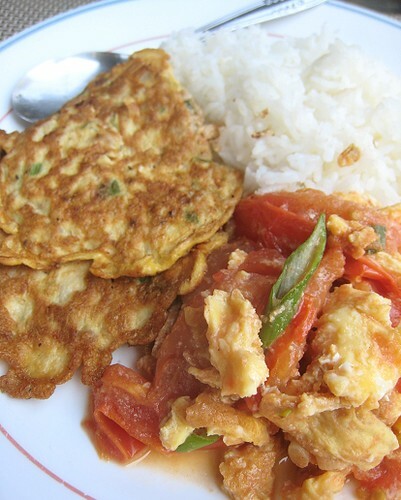 Stir-fried Egg and Tomato is part of an Eggy Home-style Meal. Seasaltwithfood also made Fried Eggs with Tomatoes. Beat eggs with 1/2 tsp salt until smooth but not frothy. Heat 1 Tbsp vegetable oil in a 12-inch non-stick skillet over medium-high heat until hot, Add eggs and cook, undisturbed, just until a thim film of cooked eggs form on bottom of skillet but most of the eggs are still runny, 5 to 10 seconds. Immediately scrape eggs into a bowl. Wipe out skillet. Heat remaining 1 Tbsp oil in skillet over medium-high heat until hot. Add scallions and stir-fry until just softened, about 30 seconds. 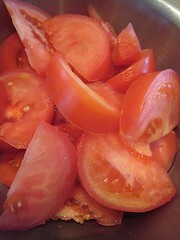 Add tomatoes and cook, stirring and turning occasionally, until juices are released and tomatoed are slightly wilted but still intact, 4 to 6 minutes. Sprinkle sugar and 1/4 tespoon salt over tomatoes and stir to combine. 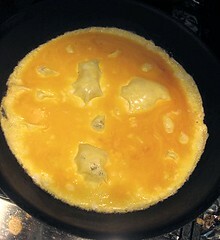 Return eggs to skillet and cook, stirring occasionally, until eggs are just cooked through. Serve sprinkled with reserved scallion greens. I dont know why tomatoes and eggs are a match made in heaven. A simple combination like this is so flavorful! I have been seeing this dish a lot lately now I feel like making it! You are so right, my mom made this a lot when I was a kid. I like it alot simple, nutritous & appetising. There is a way to avoid the eggs getting overcooked.it's pour in the egg mixture, quickly break it into small pieces using chopsticks and remove from the pan/wok. My mom like using ginger as well. Thanks for reminding this comforting dish. I haven't seen "Chinese Tomato Soup". You should blog about it! Hehe... maybe it's a food blog trend. Thanks for the tip. I was too busy looking for the camera to get the eggs out quickly! Teehee.